The W427 E was HSV's hero car nearly a decade ago. HSV has had a few hero cars over its near 30 years of operation and one of the more memorable has to be the W427 E series. In some ways it could be seen a consolation prize for the much-anticipated HRT 427 project, which was dropped. And it was a pretty good substitute. It had the full 7lt engine, with good numbers: 375kW (503hp) at 6400rpm and 640Nm at 5000. Typically for HSV it was a pretty tidy handler, despite being a big and heavy car. We did a launch story on this car when it was released late in 2008, with the assistance of V8 Supercar legend Mark Skaife. 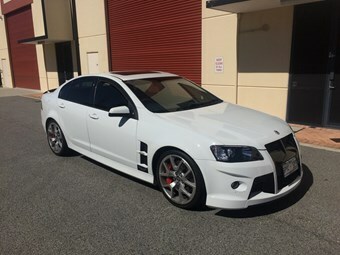 "But if you want the most powerful, most capable and most exciting car ever built in Australia and you're an HSV fan, the lure of the $155,000 W427 may be simply irresistible." Okay, so what’s one worth today? The owner of this time-capsule example WA says it has under 15,000km on the clock and is asking $195,000.